Grills that are left exposed to the elements all year long tend to become corroded. The corrosion causes them to stop working long before they should. 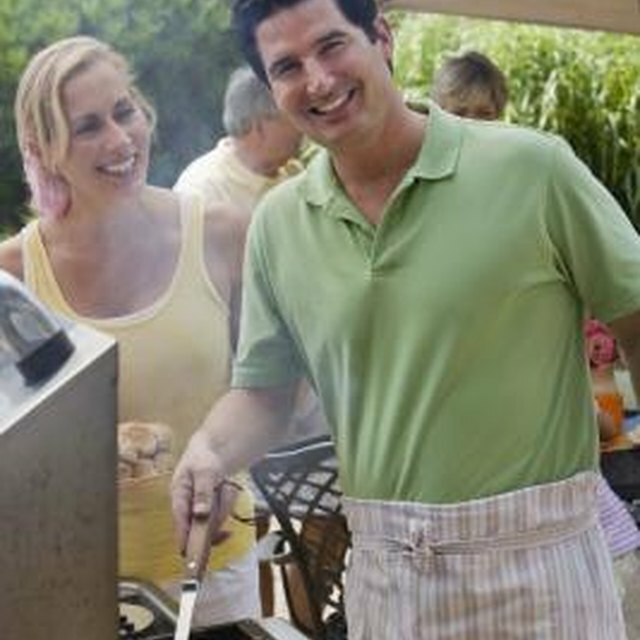 Covering your barbecue will protect it from weather-related problems and will make it last longer. Custom sewing a cover for an outdoor barbecue is an inexpensive way to get a durable, attractive, one-of-a-kind cover. Gather the supplies needed to make the pattern: wide paper, tape, scissors, and a marker. It is possible to buy a grill cover pattern from Simplicity's website, but make sure to check grill dimensions and also check the suggested notions list on the back of the pattern before cutting the fabric. Newspaper and old wrapping paper work nicely for patterning. To make the cover, get a good, waterproof fabric, drawstring cord and sturdy thread. A heavy duty or industrial sewing machine will be necessary for sewing the fabric because the heavy fabric can damage a light duty sewing machine. Use the tape if it is necessary to expand the wide paper. It needs to be wider than than the barbecue at at the grill's widest point. Check the size of the pattern paper by placing it up and over the grill. It should cover the front and back with about three inches of excess paper hanging over the sides. Run a second paper strip up each side, then tape the paper sides to the big piece of paper that goes up and over the grill. The pattern paper should fit loosely over the grill. Look for places with excess paper. Use the marker to draw cutting lines, shaping the paper to follow the lines of the grill. Mark the corners, the front and back, and any other shapes, like shelf corners. Do not shape the paper below the shelf because the cover will not go on the grill if it is too narrow at the bottom. Use the marker to add one inch of seam allowance outside of the marker lines. Use the scissors to cut the taped seam lines and to follow the outer set of marker lines. Add four inches at the bottom and mark the fold line. This is for the drawstring cord. Put the pattern on the fabric and cut around the pattern. Copy the marks from the pattern onto the back side of the fabric. When this is done there should be one large piece of waterproof fabric and two smaller ones. Put the right sides of the fabric together, lining up the corner marks. Keep the marks lined up as closely as possible when sewing the fabric cover. Sew both sides closed. Turn the cover right side out and put it on the barbecue to make sure it fits. It should follow the shape of the grill without being too tight. If the cover looks right, take it off and fold the bottom edge under, following the four-inch fold line. Put the drawstring cord in before sewing---just make sure it does not get caught in the seam. Leave a three-inch gap when sewing for the ends of the drawstring to hang out.